The Tel Aviv District Court on Monday sentenced Lenin Altouri, 24, from the Israeli Arab village of Kassem, to 16 years in prison, after he was convicted of being in contact with a foreign agent with the intention to betray the country. Altouri was convicted of plotting to aid Hamas kidnap soldiers and transfer them to Hebron or Ramallah, and of helping a criminally-motivated killing. Judges Shelly Timan, Tchiya Shapira, and Sara Brosh wrote in the indictment that they could not ignore the severity of the violations. "Violations of this type obligate a heavy, real, and painful sentence," they said. 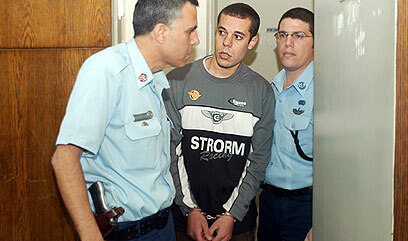 Altouri was convicted as part of a plea bargain. Two years ago, he was a member of a Hamas terror infrastructure, and made first contact with the organization through phone calls with his uncle, Assad Taha, a Hamas member from Gaza. Altouri told his uncle he would "do everything" for Hamas. Taha asked Altouri to kidnap soldiers and bring them to Hamas members in Hebron or Ramallah. Altouri replied by saying that he would need money, and was directed to a third person, who gave him NIS 2,000 (about USD 425) in cash. In a second case, Altouri was convicted of aiding a criminal killing and smuggling weapons. In December 2003, he arrived armed with a gun to the town of Ramle, where he met Rafi Cohen and an additional person, with whom Cohen was in a financial dispute. Altouri cocked the gun for the third person, who later shot and killed Cohen, and two fled the scene. Altouri was arrested last summer in a joint police and Border Police operation, following intelligence received. Judges wrote that would have known the "fatal outcome caused at the end of the of a day by the cutting short of a person's life, justifying a severe and deterring punishment by the High Court." Lawyer Ehud Ben Ehud, who represents Altouri, said: "This is a harsh punishment, out of proportion, despite the fact that Alturi's role was minimal. He was used because of his age and financial situation, and unfortunately the court did not put enough emphasis on that. We plan to appeal. We have a feeling of injustice under the law." Muhammad Altouri, Lenin's father, claimed after the verdict that the man who transferred funds to his son is an Israeli Arab living in the village of Qalansuwa who has not been arrested. Muhammad also claimed that the man was an agent for the State. See all talkbacks "Soldier kidnap plotter gets 16 years in jail"